A lot goes into successfully marketing a business. As your business grows, so does the list of tactics and tools you use. 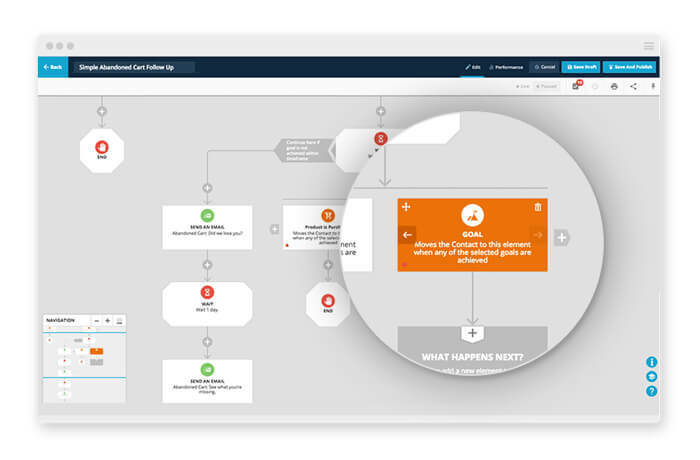 Learn eight ways that a visual all-in-one marketing automation platform can make every campaign a cohesive, relevant and tailored experience for leads and customers. When you’ve got a growing small business and you begin experimenting with more and more marketing tactics — email funnels, digital ads, landing page opt-in forms — it’s easy to end up with up a bunch of disjointed, incomplete pieces of marketing campaigns that don’t cohesively fit together. As a result, it’s not uncommon for your customer experiences to begin mirroring that disjointed approach. They are neither seeing consistent messaging nor appropriately moving through your marketing funnels to grow their relationship with your brand. Marketing campaigns solve that problem. Campaigns are well-planned, coordinated funnels that incorporate every piece of your marketing. Take it a step further and put those campaigns into a visual campaign builder, and you’ve got automated, responsive funnels that ensure you’re giving each lead and customer a cohesive, relevant and tailored experience. 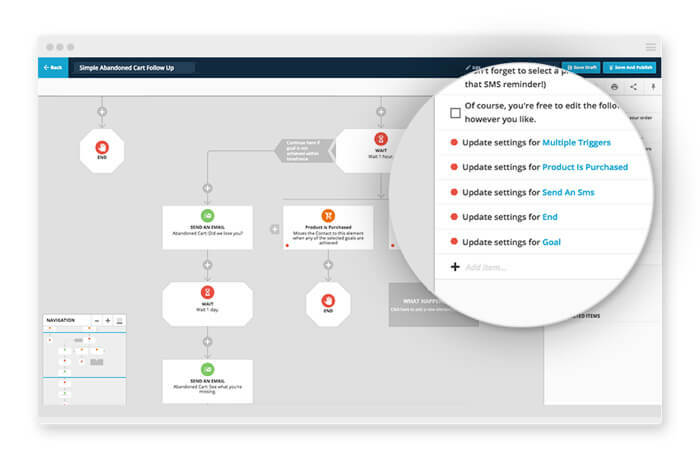 Using a visual campaign builder also improves the experience for you: It enables you to manage all your customer data in one place and gain insight into your campaigns so you can optimize and reach your goals. With so many variables and an almost infinite number of combinations for follow-up steps and channels within marketing campaigns, a visual representation becomes very useful for understanding how all the pieces fit together and ensuring there are no holes in the flow. Automated marketing campaigns allow you to instantly see and comprehend all the paths in your business that customers and leads may travel within your campaign — making it easier for you to build, manage and optimize. Gone are the days of trying to remember where all the pieces of your marketing campaigns are and how contacts flow through them. Your new visual experience tells you exactly what’s happening to contacts, without you having to trace their path back or reference rules and automation settings that might be hidden from immediate view. 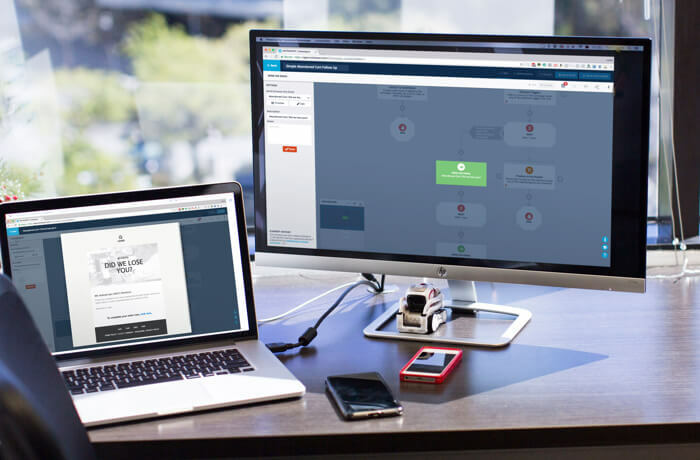 With marketing automation software, you can set up your campaigns faster than ever. As you diagram the way contacts will flow through your campaign, you are actually building the path they will travel. The map and the automation are one and the same. That means from start to finish, you’ll be able to create and launch your campaigns on a single platform — no third-party mapping tool needed. 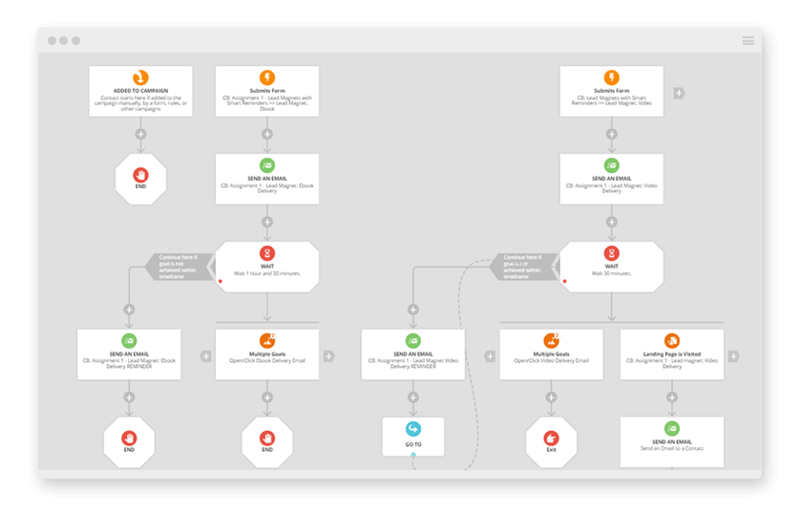 Your visual campaign builder’s graphical representation of your automated systems may look like a simple flowchart, but it’s powerful enough to control everything that happens to each one of your contacts, leads and customers. Most marketing tools only manage pieces of your campaigns, such as your email funnels or your landing pages and forms, causing your campaigns to be fragmented and nearly impossible to fully coordinate. Visual campaign-building platforms uniquely combine your offline and online campaign assets all on your single campaign map, providing you with a complete, integrated campaign and clear insight into how all your efforts are working together. They also ensure that all your customer data is in one place, giving you everything you need to make educated decisions about how to optimize your campaigns. What that ultimately means for your customers is a seamless experience with your brand, as well as truly relevant and responsive messaging every step of the way. The series of interactions your contacts have with your brand make up the customer journey. Because each of your leads and customers are unique — they’re interested in different aspects of your brand or product, and they respond to different ads and messaging you present to them — their experience with you should be uniquely tailored to them. Using an automated campaign, you can set up custom goals, triggers and filtering to completely personalize the path that each lead or customer follows throughout your campaign based on their unique interests and actions. Creating a well-defined customer journey that is dynamic and responsive to every action someone takes within your campaign means each person has a relevant, timely experience — which leads to more conversions and loyalty. Most businesses are running more than one campaign at a time, and campaigns involve many moving pieces. Most marketing automation solutions offer several features that help keep everything organized and easy to manage. 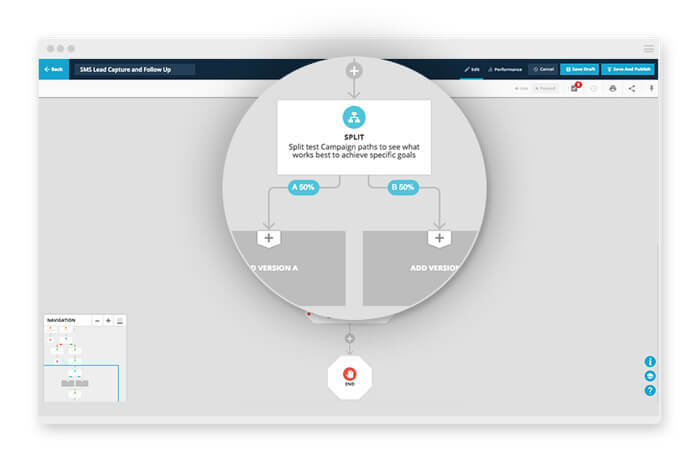 For example, the ability to “nest” campaigns allows you to combine numerous campaigns for the bigger-picture view on one simple map and then drill down into various parts to view the details. Additionally, in platforms like ONTRAPORT, as you build your map, checklists are automatically created and stored to remind you to create the campaign assets you’re mapping before publishing your campaign. Those assets, such as emails, landing pages and ads, are also embedded within the map, allowing you to truly see and access every part of your campaign in one place. Once your campaign is running, you can visualize how contacts have moved through your campaign and understand your conversion rates by looking into your campaign data. Where are my best customers coming from? How well is my funnel converting at each stage? Which campaign elements are most effective? How long does it take for prospects to become customers? What is the lifetime value of customers from each source? Visual campaign reporting takes your metrics to the next level because it goes beyond mere numbers to present you with a visual performance model that makes sense intuitively; you can truly understand your contacts’ behavior and your campaign’s effectiveness at a glance. Using the insight you’ll glean from visual performance reporting, you can make faster, smarter decisions about your campaign based on data. You can then optimize quickly and try new things in rapid succession to get the best results possible. In addition to the useful performance data, some marketing campaign builders allow for weighted split testing so you can test a smaller audience on something before committing more of your marketing dollars toward it. For example, to test two versions of a landing page, you can send 90% of your audience to a version you’ve previously found successful at encouraging conversions while testing a new landing page version with only 10% of your audience. From there, you can steadily understand and improve your conversion rates without putting all your eggs in one basket. With the option to select from a Campaign Marketplace full of dozens of pre-built campaign templates, you can skip the mapping and building altogether and launch a sophisticated campaign running in a matter of minutes. Each template comes complete with all the required campaign assets, such as emails and landing pages, which can be customized to your brand. It’s now simpler than ever to launch high-converting, proven campaigns even with little marketing experience or minimal time available. What’s your favorite part of Campaign Builder? Let us know in the comments below.